This application, originally created by Dr. James Oris, lets students be the captain of a fishing boat and experience the choices that need to be made to prevent over-fishing. Students submit an effort each ‘fishing season’ and watch the collective population data change as other teams submit their own efforts. Students can choose to refrain, or fish as much as they desire. “Free Market” teams of students compete against each other to see who can catch the most in the 20 years. Ultimately, greed causes free market teams to lose as a result of diminished populations. Likewise, consortium teams are rewarded for their patience. 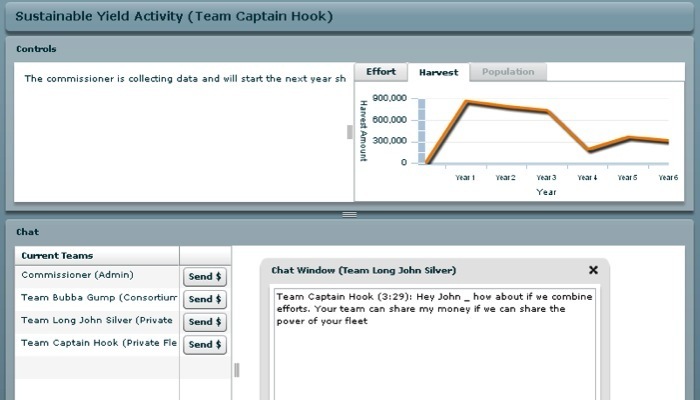 Students can use the chat and wallet functions to purchase other fleets and gain their fishing power, or communicate a strategy to sustain the population’s growth for the next season. The application was upgraded to allow real-time data and communication to be passed to the students using Flex and Flash Media Server. This entry was posted in Game, Interactive, learning activity, training and tagged Arts and Sciences, biology, botoany, business, finance, fishing, flash, flex, sustainable yield, zology by Britt Carr. Bookmark the permalink.